My daughter Natalie is a 4-year-old genius. 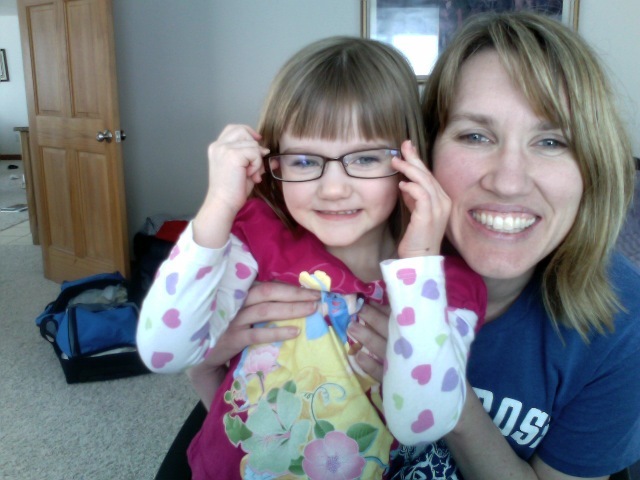 (Doesn’t she look great in my glasses?) She’s like a grown-up, intelligent woman in a little tiny body . . . assuming that the grown-up, intelligent woman pees her pants a lot and screams like she’s being axe-murdered when her socks “feel funny.” Anyway. I was looking through some old abandoned drafts and I found this comment that Natalie made to me one morning. It wasn’t just any morning. It was one of those mornings where you’ve decided to give up before the sun even rises. I think I actually crawled back into bed and told her that I’d decided to stay in bed all day and hide. She bellowed with great sincerity: “Nooooo. We love you. We want you to get up every day.” I have to admit, it made me feel better, and I (mostly) recovered and survived the day. « GCBC Week 23: What Have You Done With My Name? She IS a genious! And adorable too! You might need to frame that statement and hang it in the kitchen. Just a little reminder on those rough days. Atta girl! Hey aren’t you supposed to be writing a book! Love it. She is too cute! And Aaron freaks out about his socks all the time, too. Why do socks have to have a seam across the toe, I ask you. My life would be 75% easier if they didn’t. Oh man, can I just say a gigantic AMEN to that! Thank you, Natalie. And Stephanie, too. It’s nice to know we aren’t the only family struggling to have clothes to wear on Sunday morning. :O sort of… I mean, I’m sorry you go through it, too… but glad to know we aren’t the only ones. ;O One of my 16 year old boys lost his pants while out of town, and is stuck with jeans right now. Yikes! You have taught her well. You are as good a mother as I always knew you were! (That makes it sound like we are old friends…I mean as long as I have read your blog!) Is your book going to be about mothering? Did you already mention what you were writing about and I just missed it or is it a secret? That is precious. I love writing down and rereading the sweet/funny things my kids say. The other night over dinner my almost 4 year-old announced, “I don’t want a new mommy, I just want you.” I was flattered. Natalie sure is a little sweetheart! I so feel for you on the sock thing. Not fun. Oh, and I’m so glad my husband has diamonds in his ring! We would starve if he didn’t. Such a cute girl you have there.